Marge Rubin understands the importance of being informed. "Real estate can be very emotional," she says. "Whether a client is buying or selling, it's an enormous financial commitment." Plus there may be time constraints and other pressures to complicate a transaction. To balance those pressures, Marge offers a positive, can-do attitude along with a rich supply of knowledge, information, and good sense. Born and raised in Milwaukee, Marge moved to Oshkosh in 1990. She is one of the state's most educated Realtors, having earned a Doctorate of Education in Higher Education Leadership from Nova Southeastern University. She also studied Business Administration, Economics, Management, and Marketing. 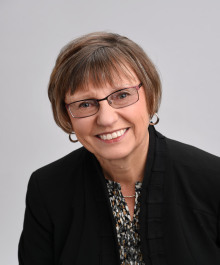 Before launching her career as a real estate professional, Marge was an educator and manager at Fox Valley Technical College for more than 24 years. Her education and leadership experience has proven to be an asset to her real estate clients. "I am both a people person and a process person," she says, "strategic yet detail-oriented." The ability to see the big picture while managing the fine details is critical to success in real estate, where fulfillment of a client's long-term goals may hinge on the understanding of a few words in a contract. Energetic and determined on behalf of her clients, Marge is an experienced facilitator and collaborator. Her calm, straightforward approach, technical savvy, marketing expertise, and responsive communications inspire confidence and trust from her clients. To learn more about how Marge can help you with your Homework, contact her directly by phone at (920) 312-6192 or by email at rubinm@firstweber.com.